MoreWith more than 30 years of experience, our attorney at the workers' compensation law office of Kaylor, Kaylor & Leto, P.A., is dedicated to helping injured employees in Lakeland, Florida, and throughout Hardee, Highlands and Polk counties. Offering free initial consultations and accepting credit card payments, we also have office locations in Sebring, Winter Haven and, by appointment, Tampa. Our attorney has received a BV Distinguished* rating from Martindale-Hubbell and is fluent in...With more than 30 years of experience, our attorney at the workers' compensation law office of Kaylor, Kaylor & Leto, P.A., is dedicated to helping injured employees in Lakeland, Florida, and throughout Hardee, Highlands and Polk counties. Offering free initial consultations and accepting credit card payments, we also have office locations in Sebring, Winter Haven and, by appointment, Tampa. Our attorney has received a BV Distinguished* rating from Martindale-Hubbell and is fluent in Spanish. Following a workplace accident, people may have a range of concerns. When will they be able to get back to work? Who will pay their medical bills? How will they afford their living expenses while they are off work recovering? We help people navigate the state's workers' compensation insurance system by aiding in filing the appropriate forms and documentation, as well as pursuing an appeal when their claims are unjustly denied. Should disability resulting from on-the-job injuries and other accidents or certain medical conditions prevent people from performing a job, they may be entitled to Social Security Disability Insurance benefits. Our law office works with clients to determine their eligibility and guides them through the often-complicated application and appellate processes. Our main location in Lakeland sits diagonally across from the Social Security Administration office. 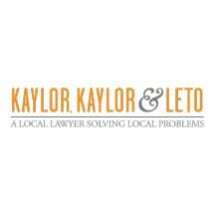 In addition to aiding people with workers' compensation and SSDI-related issues the law office of Kaylor, Kaylor & Leto, P.A., accepts nursing home neglect, medical malpractice, auto accident and other personal injury cases. Advocating on our clients' behalf in and out of the courtroom, we strive to help those injured through the negligent, reckless or intentional actions of others to achieve financial justice. Gold Sponsor - Outstanding Advocate for Justice by Florida Rural Legal Services, Inc.